Happy Holidays! Here are your Rawstudio presents! All of us from the Rawstudio team hope you have all enjoyed your holiday! We have spent some of the last days polishing Rawstudio up for a 2.0 Beta release. The main focus has been GUI polishing, speed optimizations and final bug fixes and testing. However, there is also some new features that should help a lot in the everyday use of Rawstudio. There are a few major new features, that I will give a short description in the following. We have added a built-in tethered shooting mode. This enables you to capture images directly from your camera into Rawstudio. You can either take photos by clicking in the UI, or monitor you camera and automatically download any images you take. This feature should be especially helpful if you have a studio setup, where you take pictures in a controlled environment. Then you can quickly review your images and do a quick adjustment and evaluation of your images. This is the basic look to the Tethered Shooting window, you can unfold the tabs for more options. We are using gphoto for connecting to the camera, so the first thing you must do is to see if your camera is supported by gphoto. Do note that not all cameras in the list have capture support, and if it doesn’t, you will probably not have any luck in grabbing photos. You have several options available. First of all, you can choose if you want the photos to be automatically opened by Rawstudio. 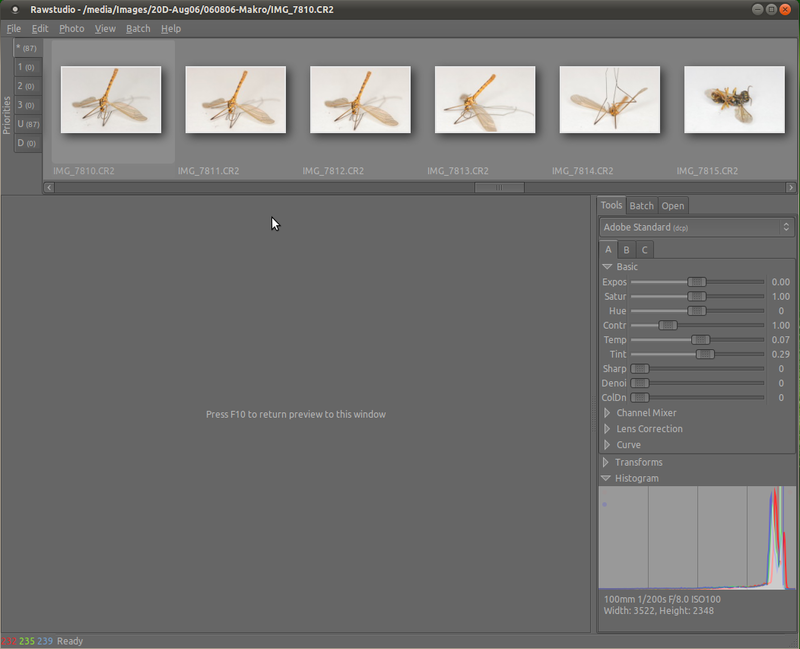 Second, you can select to have your image adjustment transferred to new images you shoot. This way any adjustment you make, will be carried over to the next images automatically. Finally you can use a filename template, the same way as in batch/quick export, and you can automatically add tags to your images. The last feature of Tethered Shooting I will mention is Interval Shooting. For this you can set up an interval between with a photo will be taken. This can be helpful if you want to shoot timelapse video. It is now possible to move the image you are editing to a fullscreen secondary monitor. This should be very useful if you have a dual-monitor setup, so you can have the image shown without anything disturbing it. If you have more than two monitors, you can select which screen for the fullscreen preview to open on. To access the right-click menu, you have to go to the screen with the image. The loupe (ctrl+left click) is also available in fullscreen mode. 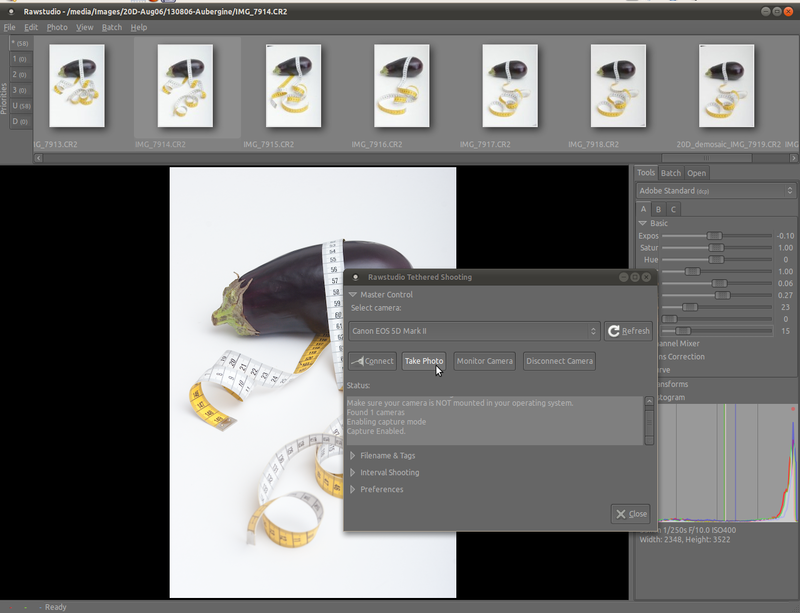 A long awaited feature is that Rawstudio is able to automatically crop images after lens correction has been applied. When lens correction has been applied there is usually some parts of the border of the image, where there isn’t any valid data, because there isn’t enough information in the image to fill it out. This results in duplicated pixels along some places of the border, which in many cases is undesirable. A typical example of border leftovers from lens correction. This is now automatically cropped away. 1) The image must be opened in Zoom to Fit view, because otherwise the complete image isn’t rendered, and we don’t know the crop to make. If you have opened an image in 100% view when opened, simply re-open it in Zoom-to-Fit view. 2) You must have had the image opened once for the crop to be applied, so if you want to batch export a lot of images, you must have had them opened. We will try to fix these two issues as soon as possible. We have received a lot of feedback from users who have tried the daily builds. The feedback has been very encouraging and has helped us a lot to focus on the important stuff. Thanks a lot for the feedback – keep it coming. Add “Copy Image to Clipboard”. You can now edit all the adjustments by clicking the number in the toolbox. Considerably faster load times when opening a directory. Disable background processing while opening an image. Add function to disable loading selected images for tagging and deleting images. XMP metadata is now added to exported images if libexiv2 supports it. Add support for Pentax 645D. Add load support for Olympus E-5. Add support for Panasonic GH-2. Add color profiles for Panasonic GF-2, Sony A560 & A580. Nikon D7000 and D3100 Whitebalance support. Use display colorspace for batch export preview. Export As: Ask whether to overwrite existing files. Made mousewheel scroll thumbnails anywhere in iconview. Tags are now added to images in a background task. If tags are to be re-added to the database this is now done as a background task. Nicer drop shadows on icons and better placement of icons. Show error and success dialog after update of lensfun database. Unfinished background tasks are now displayed at exit. Truncate very long filenames in iconview. Add support for legacy Minolta DiMAGE 7i. dcraw updated to v9.05 for exotic image loading. 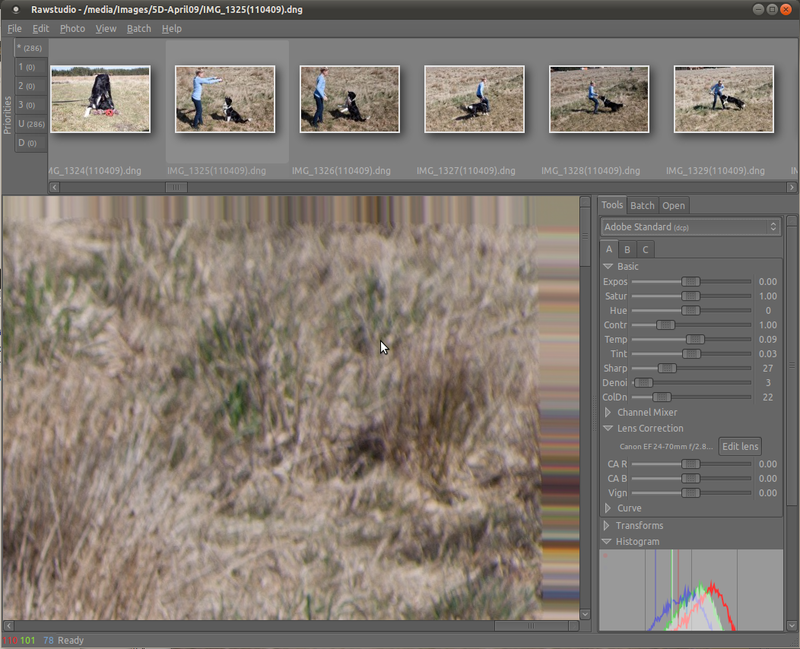 Set correct camera defaults, when batch exporting images. Export As Dialog: Make sure percentages and sizes are updated along with each other, and allow scale up to 1000% (up from 200). Don’t shut down without a message if tag database cannot be created. Make sure all tags are backed up to local files. Straighten now works as expected on mirrored images. Lensfun lens updates should now work, and doesn’t require subversion to be installed. Don’t save the same autotags several times. Fix wrong color on pure red colors. Fix profiles not being correctly selected in some export cases. When resetting settings, reset to camera WB. When resetting settings, indicate that curve has changed. Fix typos in K/M Maxxum 5D+7D profiles. These are only a few of the many updates that has been made.Also a big thanks for the bug reports – it helps us a lot, because there are some aspects and configurations we don’t test on a regular basis. We hope you enjoy the updates and have a happy new year! Thanks for the reports/requests – all are very helpful! Things are working nicely. How can I donate some money? Do you know if i can tether with a Sony a580? Right now I know you cannot. I do however have a patch at home that will probably be applied tonight which might make it work. If these work, there is a good chance your camera will work when I’ve submitted the patch. “–” is two times “-” (minus). It seems the software is putting them together to an N-dash.